China Environmental Grating, Steel Grating in Wastewater Treatment Plants, Steel Grating in Park Manufacturer and Supplier. Product categories of Steel Grating In Environmental Projects, we are specialized manufacturers from China, Environmental Grating, Steel Grating in Wastewater Treatment Plants suppliers/factory, wholesale high-quality products of Steel Grating in Park R & D and manufacturing, we have the perfect after-sales service and technical support. Look forward to your cooperation! Steel Grating has been used in the environment market for many years. From water and wastewater treatment plants to oil rig platforms, our steel grating has a variety of products suitable for your project requirements. 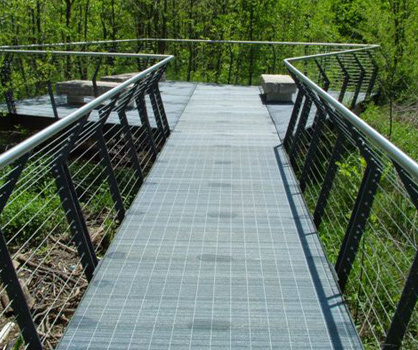 Products can be manufactured from carbon or stainless steel in variety of configurations and can be used for trench grating, maintenance walkways or full platforms with stair tread. Slip resistant surfaces are also available to enhance the safety of these products, where dust, water or oil can cause hazardous conditions.